Leporello: one b/w portrait made by photographer Filip Tas of each artist With pictures from: Mike Zinzen, Wim Van De Velde, Paul Van Hoeydonck, Roger Wittevrongel, E.L.T. Mesens, Raoul De Keyser, Jef Verheyen, Pierre Caille, Gaston Bertrand, Guy Vandenbranden, Marc Mendelson, Frans Luyckx, Marcel Marien, Louis Van Lint, Gustave Marchoul, Simone Lacour, Hugo Heyrman, Marcel Overberghe, René De Coninck, Marc Verstockt, Jan Vaerten, Marc Eemans, Jean-Marie Londot, BOEL, Félix Roulin, Berthe Dubail, Camiel Van Breedam, Robert Geenens, Octaaf Landuyt, Panamarenko, Marcel Broodthaers, Roger Raveel, Dan Van Severen, Pol Mara, Yves De Smet. Beautiful old document. 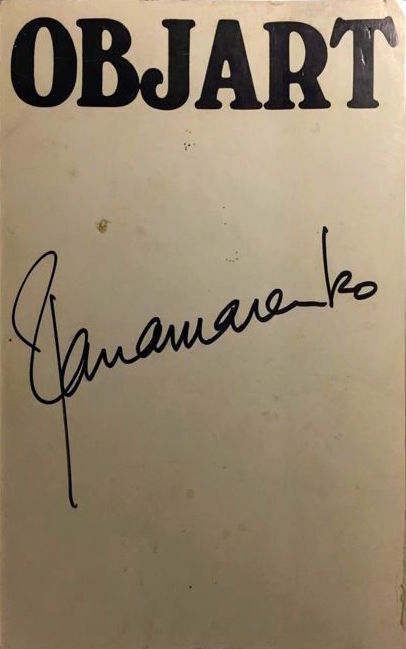 Hand-signed on cover by Panamarenko.